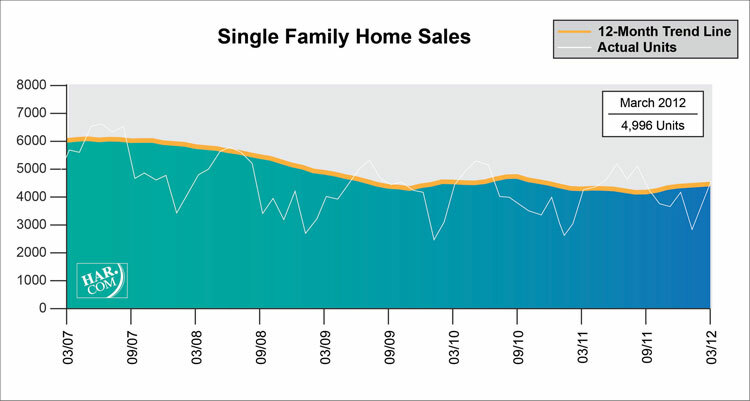 HOUSTON  (April 17, 2012)  The Houston real estate market enjoyed a tenth consecutive month of rising sales in March, with homes continuing to sell quickly enough to keep housing inventory at its lowest level since December 2008. 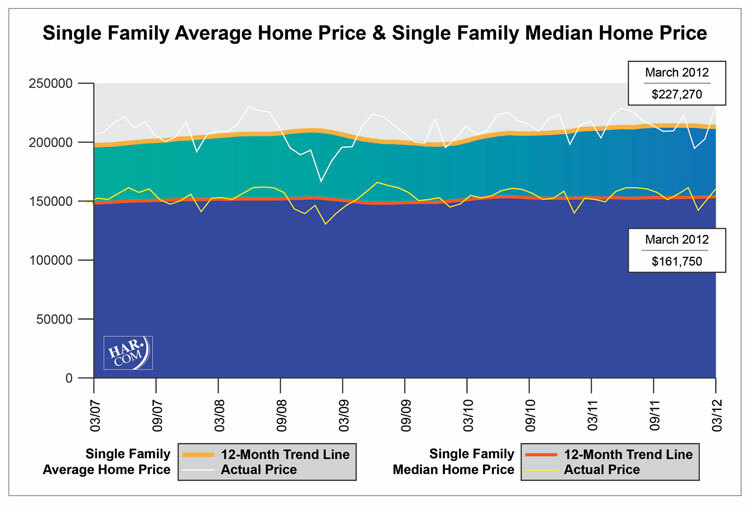 Average and median prices achieved the highest levels for a March in Houston, with the average price coming just a few dollars shy of the all-time high set in June 2008. According to the latest monthly data prepared by the Houston Association of REALTORS® (HAR), March sales of single-family homes rose 7.8 percent versus one year earlier. That follows February's 15.6 percent jump which was the biggest sales boost since last September. Declining sales of homes priced below $80,000 combined with increased activity in the luxury housing segment fueled the pricing gains. "March was an excellent month for home sales in Houston and the healthy appreciation in pricing is welcome news as well," said Wayne A. Stroman, HAR chairman and CEO of Stroman Realty. "Inventory remains at its lowest level in more than three years and is outpacing the national real estate market. The moderation in pending sales in March could possibly translate to a leveling off of sales before we enter the summer buying season, but we will know for sure next month." The March single-family home average price rose 5.7 percent year-over-year to $227,270, the highest level for a March in Houston and only $70 below the all-time high reached in June 2008. The median pricethe figure at which half of the homes sold for more and half sold for lessclimbed 7.8 percent to $161,750, also a record high for a March in Houston. The month of March brought Houston's overall housing market positive results when all sales categories are compared to March 2011. Total property sales, total dollar volume and average and median pricing rose on a year-over-year basis. Month-end pending sales for March totaled 4,162. That is down a fractional 0.7 percent from last year and may suggest a slight tapering of sales when the April housing data are compiled. The number of available properties, or active listings, at the end of March declined 17.8 percent from March 2011 to 41,997. For the second month in a row, the inventory of single-family homes held to the lowest level since December 2008-5.6 months. That compares to 7.5 months one year earlier and means that selling the entire inventory single-family homes currently on the market would take 5.6 months to complete based on the past year's sales activity. The figure is superior to the national inventory of single-family homes of 6.4 months recently reported by the National Association of REALTORS® (NAR). These indicators continue to demonstrate that Houston has a balanced real estate marketplace.